I am quietly thrilled. I am the keeper of things. He arrives as I finish up the dishes and wipe the kitchen counters. I hug my first born son- life changer, trail blazer, heart breaker, 33 years of connection, love, and journey together infused in an embrace. We walk the time line through the laundry room and into the garage where the archives of family life line the walls- boxes labeled “Patrick’s GI Joes”, “brio train”, “Christmas decorations”, “dress up clothes”, the wooden toy horse made by Grampa Healy, a shelf crammed with size 13 crocs. We rest our eyes on the row of sleeping bags and tents above the work bench and the requisite green plastic tubs that hold the treasures of camping trips of yore- plastic table cloths autographed and decorated by camping buddies, liquid dish soap, camping stoves, a variety of pots and pans, lanterns, plastic forks and spoons, make shift coffee makers, propane tanks, camping games. I am the keeper of things. I have worked over- time trying to keep life consistent and predictable for my three sons through two major relocations, new schools, new friends, various homes, their parents’ divorce, the transition to college and eventually to adulthood and the fast and furious challenge of living in the Silicon Valley. I have housed their baseball cards and dress suits, amplifiers and cast off instruments, baseball mits, autographed baseballs, baseball hats, high school yearbooks, art projects, stuffed animals, and boomerang plants. 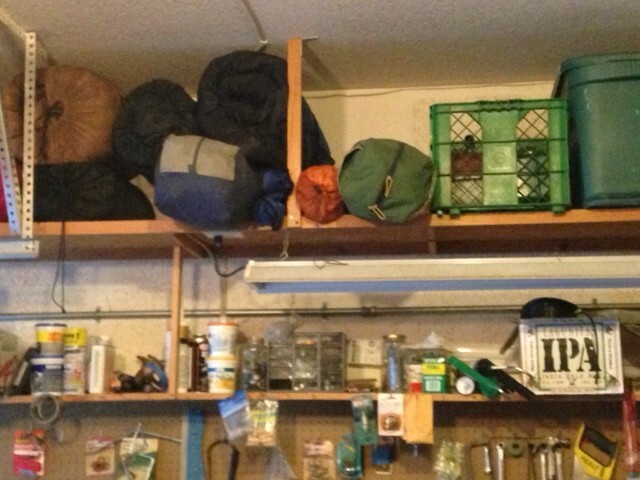 Cartons of camping gear tucked high on garage shelves. 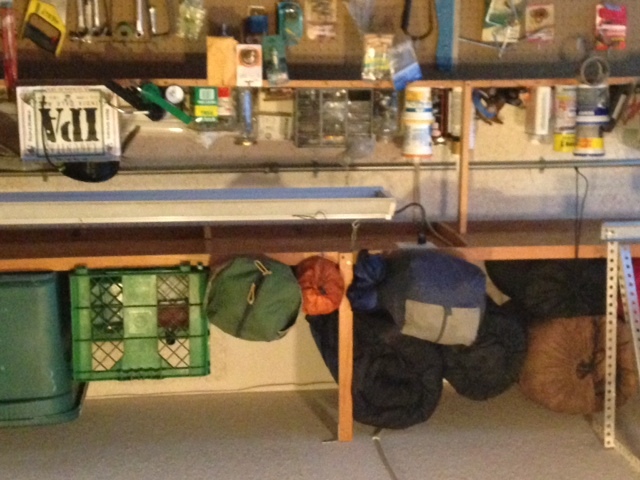 More sleeping bags and tents than one family could possibly utilize. The family pictures. I have intentionally rooted myself so that they could be free to explore and take risks and chances in the world yet still find their way back to a touchstone of familiarity and an infusion of security. I look at my handsome 33 year old son in the soft light of a bare energy efficient bulb. He’s quite a man. A full time job at Facebook, a new car, a flat in Palo Alto. He phones his 31 year old brother, Patrick, to make sure he’s not forgetting anything they might need. They discuss Nate and Chris and Todd and Sam and the things that they agreed to bring for the camping trip. Good friends from high school. Solid friends. Rooted friendships. We hug goodbye and share an “I love you”. He drives away in his sleek dependable Subaru- the temperamental yet utterly faithful Volvo thankfully a remnant of the past. I linger in the garage contemplating my youngest son Peter’s pending wedding this summer and Patrick’s journey through grad school in Denver to his current professional life in Santa Clara. They are rooted. 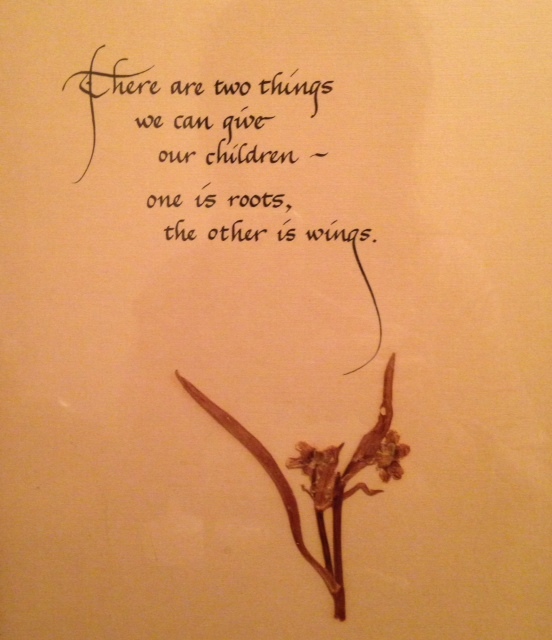 They have wings. How much longer will I need to be the keeper of things? So beautiful and poignant. There are but three” things” that last: Faith, hope, and love. 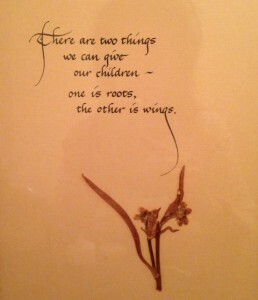 You have given all three, and will always be a keeper of these “things’, even as the children fly with grateful wings. Oh I like that.. Faith Hope and Love. Truly the most important things. Another beautiful post that Icould have wrote if I was as talented as you! I am still holding onto ‘stuff’. Maybe it isn’t for them, but for me especially since no one lives within 300 miles! The quote looks like one that I did years ago. Sharon, I think we hold on to it for ourselves! I agree with you. They are our transitional objects! I had to look at that plaque again to see if you made it. No. But you did make one that is in my kitchen “Friends are family you choose for yourself”. I love it. One of the things that made being an Air Force brat a little easier was the my mom, too, was a keeper of things. Every move – and there were MANY – she packed up dolls, ratty stuffed animals, ragtag books, toy cars, and all of our “stuff” so that when we arrived at our next assignment (often on another continent!) we had some “home” around us. I think the dubbing of the keeper happens before the keeper even knows it. It’s my mantle now, too. I still have all of Matt’s prize weight-lifting shirts (up to the much-coveted white 1000 pound shirt!) his football and the shot-put with which he broke the school record, and his bicycle hanging in the garage rafters. I still have Katie’s first school uniform and Sacramento Children’s Chorus clothes in my cedar chest. (They are SOOO little!) And my garage is a museum to years gone by. Long live the keepers! Thank you for this post, Rosemarie! I feel slightly more exalted than I did when I woke up! Kimberly, I had a lot of nice responses from “keepers”. I guess we’re not such an unusual breed! Thanks for sharing your story! Thank you, Mary! And I love seeing the pictures of your family. So beautiful!